Port competition has dramatically increased in recent years. This is due to the dynamic environment in which ports operate, which has been shaped by numerous and interrelated forces. In order to achieve survival and success, strategic planning has become of paramount importance. One of the most relevant aspects of strategic planning is indeed the analysis of competitiveness. What is the current competitive position of a port? What is the future position the port can achieve? And most importantly, what are the determinants of competitiveness? 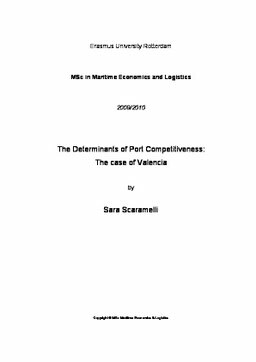 This thesis aims at identifying the determinants of competitiveness for the Port of Valencia. After having framed the subject of the research in the broader context of the shipping and port industry, the issue of competition is dealt with in details. The methodologies used to answer the research questions are first explained, and then applied to produce the results to analyse. A combination of competitiveness study techniques has been applied in order to produce a comprehensive and valid answer. In the end, the Port of Valencia has been positioned in its competitive setting; following, the determinants of its competitive standing have been detected and analysed. 16 determinants of port competitiveness have been identified, of which eight seem to be prominent. The study has also highlighted the existence of four elements which may undermine the competitiveness of Valencia, and are thus areas in which strategy should focus in order to enhance competitiveness.